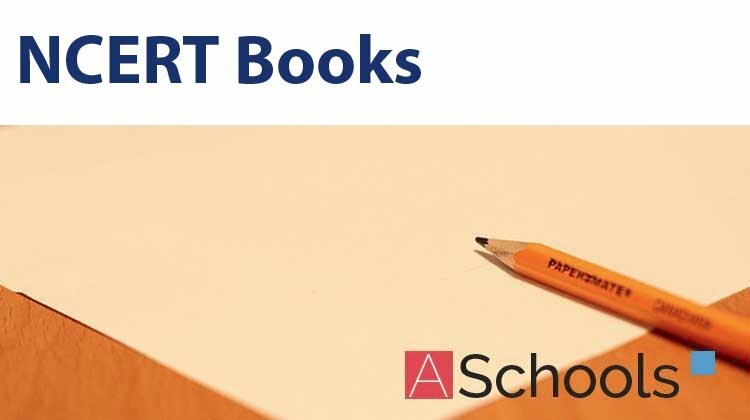 Here you can get Class 11 Important Questions Physics based on NCERT Text book for Class XI. 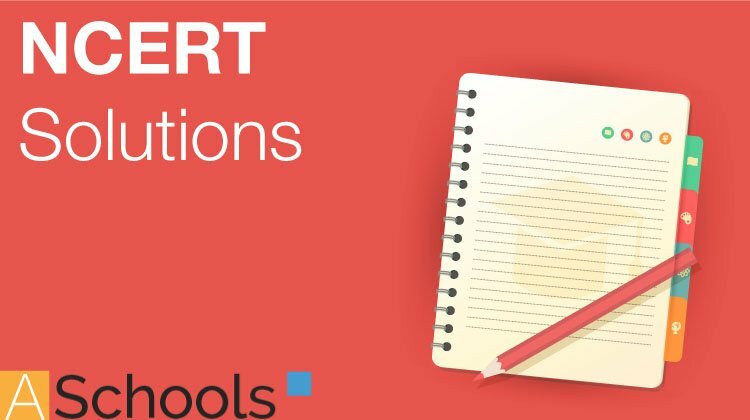 Physics Class 11 Important Questions are very helpful to score high marks in board exams. Here we have covered Important Questions on Work, Energy and Power for Class 11 Physics subject. An electron and a proton are moving under the influence of mutual forces. In calculating the change in the kinetic energy of the system during motion, one ignores the magnetic force of one on another. (a) the two magnetic forces are equal and opposite, so they produce no net effect. (b) the magnetic forces do no work on each particle. (c) the magnetic forces do equal and opposite (but non-zero) work on each particle. (d) the magenetic forces are necessarily negligible. (a) same as the same force law is involved in the two experiments. (b) less for the case of a positron, as the positron moves away more rapidly and the force on it weakens. (c) more for the case of a positron, as the positron moves away a larger distance. (d) same as the work done by charged particle on the stationary proton. (a) constant and equal to mg in magnitude. (b) constant and greater than mg in magnitude. (c) variable but always greater than mg.
(d) at first greater than mg, and later becomes equal to mg.
A body is falling freely under the action of gravity alone in vacuum. Which of the following quantities remain constant during the fall? During inelastic collision between two bodies, which of the following quantities always remain conserved? (d) Speed of each body. 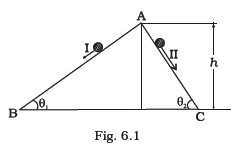 Two inclined frictionless tracks, one gradual and the other steep meet at A from where two stones are allowed to slide down from rest, one on each track as shown in Fig. 6.1. (a) Both the stones reach the bottom at the same time but not with the same speed. (b) Both the stones reach the bottom with the same speed and stone I reaches the bottom earlier than stone II. (c) Both the stones reach the bottom with the same speed and stone II reaches the bottom earlier than stone I. (d) Both the stones reach the bottom at different times and with different speeds. The potential energy function for a particle executing linear SHM is given by (1/2)kx2 where k is the force constant of the oscillator (Fig. 6.2). For k = 0.5N/m, the graph of V(x) versus x is shown in the figure. A particle of total energy E turns back when it reaches x = ± xm . If V and K indicate the P.E. and K.E., respectively of the particle at x = +xm, then which of the following is correct? 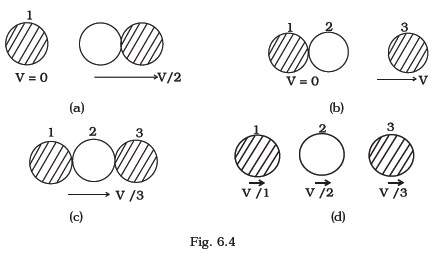 (d) V = O, K < E.
Two identical ball bearings in contact with each other and resting on a frictionless table are hit head-on by another ball bearing of the same mass moving initially with a speed V as shown in Fig. 6.3. 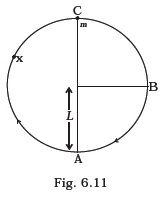 If the collision is elastic, which of the following (Fig. 6.4) is a possible result after collision? A body is moving unidirectionally under the influence of a source of constant power supplying energy. 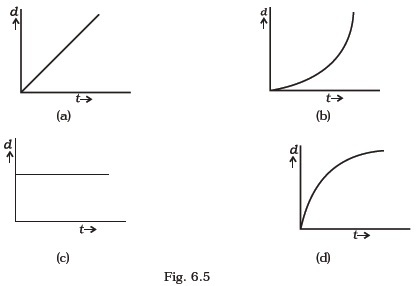 Which of the diagrams shown in Fig. 6.5 correctly shows the displacement-time curve for its motion? 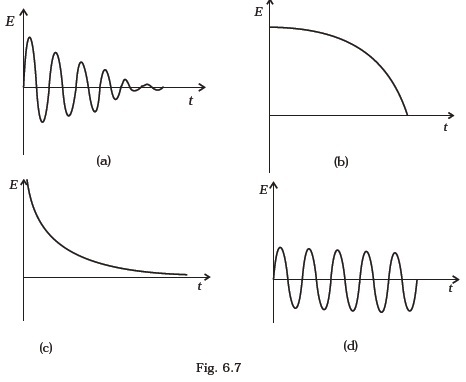 Which of the diagrams shown in Fig. 6.6 most closely shows the variation in kinetic energy of the earth as it moves once around the sun in its elliptical orbit? Which of the diagrams shown in Fig. 6.7 represents variation of total mechanical energy of a pendulum oscillating in air as function of time? 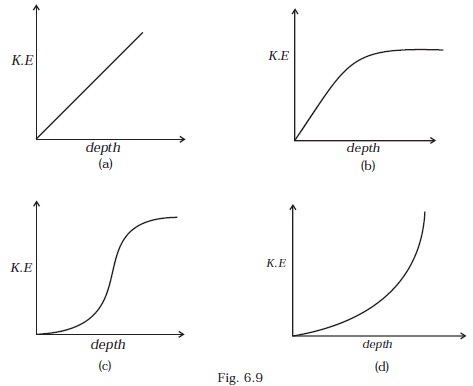 A raindrop falling from a height h above ground, attains a near terminal velocity when it has fallen through a height (3/4)h. Which of the diagrams shown in Fig. 6.8 correctly shows the change in kinetic and potential energy of the drop during its fall up to the ground? Which of the diagrams in Fig. 6.9 correctly shows the change in kinetic energy of an iron sphere falling freely in a lake having sufficient depth to impart it a terminal velocity? A cricket ball of mass 150 g moving with a speed of 126 km/h hits at the middle of the bat, held firmly at its position by the batsman. The ball moves straight back to the bowler after hitting the bat. A man, of mass m, standing at the bottom of the staircase, of height L climbs it and stands at its top. (a) Work done by all forces on man is equal to the rise in potential energy mgL. (b) Work done by all forces on man is zero. (c) Work done by the gravitational force on man is mgL. (d) The reaction force from a step does not do work because the point of application of the force does not move while the force exists. A bullet of mass m fired at 30° to the horizontal leaves the barrel of the gun with a velocity v. The bullet hits a soft target at a height h above the ground while it is moving downward and emerges out with half the kinetic energy it had before hitting the target. Which of the following statements are correct in respect of bullet after it emerges out of the target? (a) The velocity of the bullet will be reduced to half its initial value. (b) The velocity of the bullet will be more than half of its earlier velocity. (c) The bullet will continue to move along the same parabolic path. (d) The bullet will move in a different parabolic path. (e) The bullet will fall vertically downward after hitting the target. (f) The internal energy of the particles of the target will increase. Two blocks M1 and M2 having equal mass are free to move on a horizontal frictionless surface. M2 is attached to a massless spring as shown in Fig. 6.10. Iniially M2 is at rest and M1 is moving toward M2 with speed v and collides head-on with M2. (a) While spring is fully compressed all the KE of M1 is stored as PE of spring. (b) While spring is fully compressed the system momentum is not conserved, though final momentum is equal to initial momentum. (c) If spring is massless, the final state of the M1 is state of rest. (d) If the surface on which blocks are moving has friction, then collision cannot be elastic. 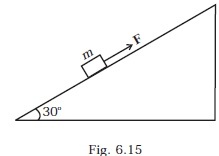 A rough inclined plane is placed on a cart moving with a constant velocity u on horizontal ground. A block of mass M rests on the incline. Is any work done by force of friction between the block and incline? Is there then a dissipation of energy? Why is electrical power required at all when the elevator is descending? Why should there be a limit on the number of passengers in this case? Calculate the work done by a car against gravity in moving along a straight horizontal road. The mass of the car is 400 kg and the distance moved is 2m. A body falls towards earth in air. Will its total mechanical energy be conserved during the fall? Justify. A body is moved along a closed loop. Is the work done in moving the body necessarily zero? If not, state the condition under which work done over a closed path is always zero. In an elastic collision of two billiard balls, which of the following quantities remain conserved during the short time of collision of the balls (i.e., when they are in contact). Calculate the power of a crane in watts, which lifts a mass of 100 kg to a height of 10 m in 20s. The average work done by a human heart while it beats once is 0.5J. Calculate the power used by heart if it beats 72 times in a minute. Give example of a situation in which an applied force does not result in a change in kinetic energy. Two bodies of unequal mass are moving in the same direction with equal kinetic energy. The two bodies are brought to rest by applying retarding force of same magnitude. How would the distance moved by them before coming to rest compare? A graph of potential energy V (x) verses x is shown in Fig. 6.12. A particle of energy E0 is executing motion in it. Draw graph of velocity and kinetic energy versus x for one complete cycle AFA. (a) For head-on collision, both the balls move forward. (b) For a general collision, the angle between the two velocities of scattered balls is less than 90°. State with reason in each case whether a particle can be found in the given region or not. The bob A of a pendulum released from horizontal to the vertical hits another bob B of the same mass at rest on a table as shown in Fig. 6.13. (a) the height to which bob A will rise after collision. (b) the speed with which bob B starts moving. Neglect the size of the bobs and assume the collision to be elastic. 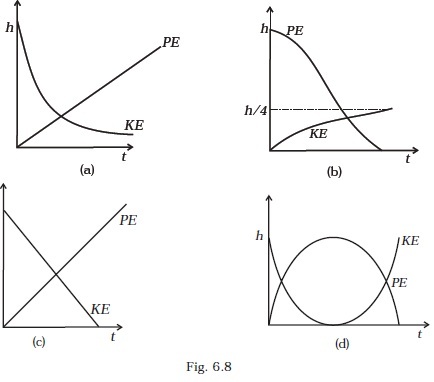 (a) the loss of P.E. of the drop. 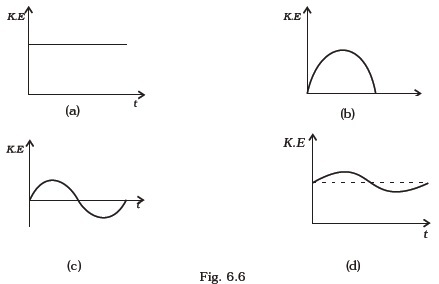 (b) the gain in K.E. of the drop. (c) Is the gain in K.E. equal to loss of P.E.? If not why. 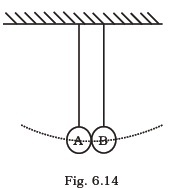 Two pendulums with identical bobs and lengths are suspended from a common support such that in rest position the two bobs are in contact (Fig. 6.14). One of the bobs is released after being displaced by 10° so that it collides elastically head-on with the other bob. Suppose the average mass of raindrops is 3.0 × 10-5 kg and their average terminal velocity 9ms-1. Calculate the energy transferred by rain to each square metre of the surface at a place which receives 100 cm of rain in a year. An engine is attached to a wagon through a shock absorber of length 1.5m. The system with a total mass of 50,000 kg is moving with a speed of 36 km h-1 when the brakes are applied to bring it to rest. In the process of the system being brought to rest, the spring of the shock absorber gets compressed by 1.0 m. If 90% of energy of the wagon is lost due to friction, calculate the spring constant. An adult weighing 600N raises the centre of gravity of his body by 0.25 m while taking each step of 1 m length in jogging. If he jogs for 6 km, calculate the energy utilised by him in jogging assuming that there is no energy loss due to friction of ground and air. Assuming that the body of the adult is capable of converting 10% of energy intake in the form of food, calculate the energy equivalents of food that would be required to compensate energy utilised for jogging. On complete combustion a litre of petrol gives off heat equivalent to 3×107J. In a test drive a car weighing 1200 kg. including the mass of driver, runs 15 km per litre while moving with a uniform speed on a straight track. Assuming that friction offered by the road surface and air to be uniform, calculate the force of friction acting on the car during the test drive, if the efficiency of the car engine were 0.5. (e) work done by applied force. A curved surface is shown in Fig. 6.16. The portion BCD is free of friction. There are three spherical balls of identical radii and masses. Balls are released from rest one by one from A which is at a slightly greater height than C.
With the surface AB, ball 1 has large enough friction to cause rolling down without slipping; ball 2 has a small friction and ball 3 has a negligible friction. (a) For which balls is total mechanical energy conserved? (b) Which ball (s) can reach D? (c) For balls which do not reach D, which of the balls can reach back A? A rocket accelerates straight up by ejecting gas downwards. In a small time interval Δt, it ejects a gas of mass Δm at a relative speed u. Calculate KE of the entire system at t + Δt and t and show that the device that ejects gas does work = (½)Δmu2 in this time interval (neglect gravity). Two identical steel cubes (masses 50g, side 1cm) collide head-on face to face with a speed of 10cm/s each. Find the maximum compression of each. Young’s modulus for steel = Y= 2 × 1011N/m2. A baloon filled with helium rises against gravity increasing its potential energy. The speed of the baloon also increases as it rises. How do you reconcile this with the law of conservation of mechanical energy? You can neglect viscous drag of air and assume that density of air is constant.